EXPERIMENTAtaúro was a pro-bono project for the cooperative Boneca of Ataúro and the community of the island of Ataúro at large. Every year, on the last Sunday of June, a traditional fishermen festival takes place in the village of Makili. In early 2011, David was approached by Piera Züetcher, founder and mentor of the Bonecas of Ataúro, with the aim to collaborately come out with a concept to support the forthcoming festival led by Father Luis (the local priest); who had already drafted the creation of a festival based on the idea of economic solidarity involving art&crafts, music, dance and gastronomy across the island and alongside the fishermen’s festival. 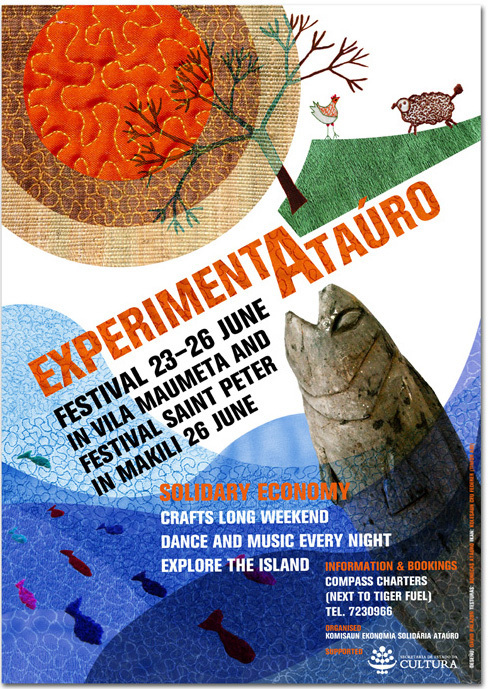 EXPERIMENTAtaúro was born and inspired by the handmade embroidery produced by the women at the cooperative, the above poster was designed, printed and placed strategically around Dili to attract tourists. David also put together a film with the same name and using footage from previous research visits to the island. (Un)fortunately when the term and design was already in the public domain, it was appropriated by the former Ministry of Industry & Commerce and its funders, who in their own right used the term and concept to re-design some unpleasant merchandising items. Overall, the double campaign worked well and the festival became a success that keeps happening every year.